Patient should be on a supine position. However, if patient has gross ascites, you might want to ask him whether it is comfortable for him to lie flat as he might have difficulty breathing if lying flat. Be sensitive. Tell the child: ‘ I am going to feel your tummy. Please let me know if you feel any pain or if you want me to stop, ok? ’. Whist palpating, look at the child’s face. If the child’s winced, stop and apologise and ask the child if he is ok. If you are tall or the bed position is low, you might want to kneel down when doing palpation. Palpate systematically. 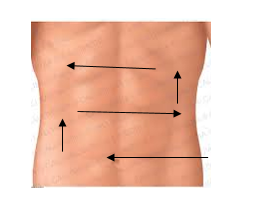 You may start from left iliac fossa and proceed in the direction above. 2. Deep palpation (palpate deeper for deeper masses. Again, warn the child that you are going to feel deeper and ask him to tell you if he feels any pain. 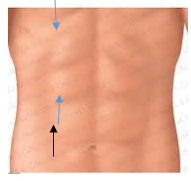 Palpate upwards from right iliac fossa towards right subcostal margin until you feel the liver edge. Ask the patient to take a deep breath and try to feel the liver edge as it descends. 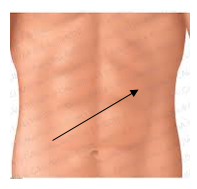 Percuss from right lower quadrant of the abdomen upwards until the sound changes from resonant to dull. This denotes the liver’s lower border. Palpate from right iliac fossa towards left subcostal margin to feel for spleen. As you reach the left subcostal margin, ask the patient to turn slightly towards you (his right side) , and palpate in the left subcostal area. Place one hand under the patient in the right flank region and the other hand on top and try to ballot the kidney between the two hands. Repeat for the left side. when new comments are added- checkbox and from now on every time a comment is added I get 4 emails with the exact same comment. Yes it’s a good revision site – but working in HE with advanced paediatric NP’s it’s also a great learning and teaching resource – thank you!